We’ve had Zabby in our house for over a week,and have quickly discovered that she is a fantastic, special dog. She has a personality that is as beautiful as she is–loving, energetic, and well-mannered. She’s crate-trained, can sit and stay well, and has awesome manners at meal-time. Though she is tall enough to grab food right off the table, she doesn’t even attempt. When we sit down to eat, no begging from her! She’ll quietly lay down in the adjoining room. She has a loving, sweet way with our kiddos, and would be a great family dog. Her size and energy might be too much for the very littlest kids (baby and toddler), but perfect for school age and above. She is so happy to receive attention from our kids and is not phased even when there’s boisterous play going on. Zabby loves her chew toys and is a strong chewer, but amazingly, seems to know which toys are hers. She hasn’t bothered our kids’ toys (which are scattered everywhere and within easy reach!). Our favorite times with Zabby are in the evenings–she is always game to lounge and snuggle with us. Zabby had TPLO surgery on 1/30 to repair her knee from an ACL tear. The procedure went great, and recovery is going smoothly so far. Rehab is not nearly as daunting as I thought it would be, and she does a great job. 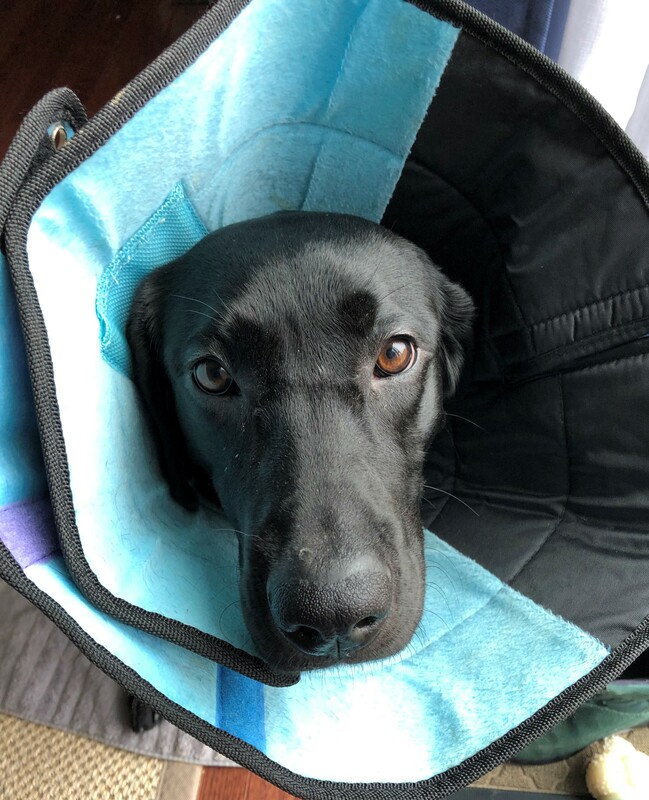 She’ll have to wear a cone until stitches are removed on 2/13–she is an absolute champ about it! It’s never a struggle to get it on or adjust. Since surgery, her happy, sweet personality hasn’t changed at all. On a follow-up visit to the vet, she managed to charm everyone in the waiting room while we waited for our appointment. 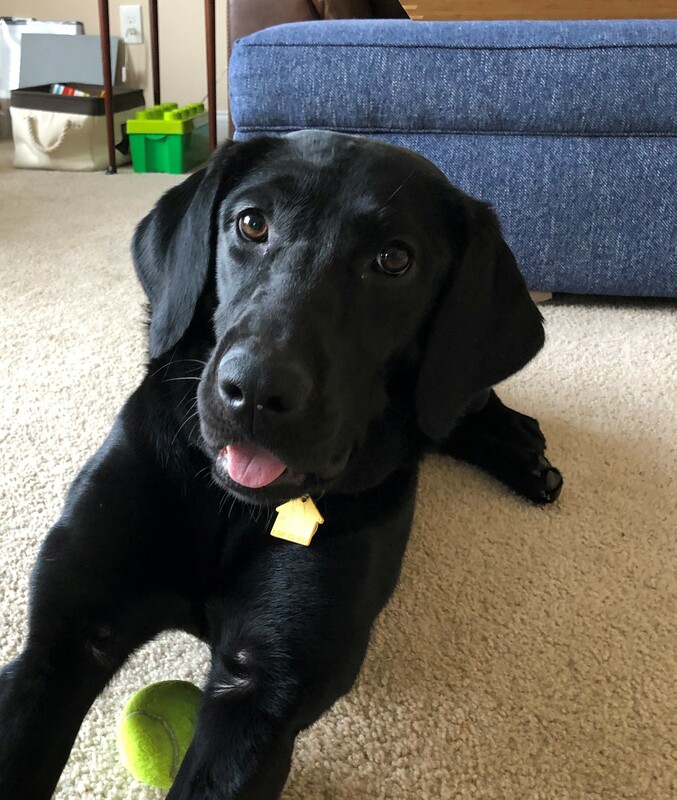 We are crazy about this girl, and know she’s going to make a lucky family very happy! 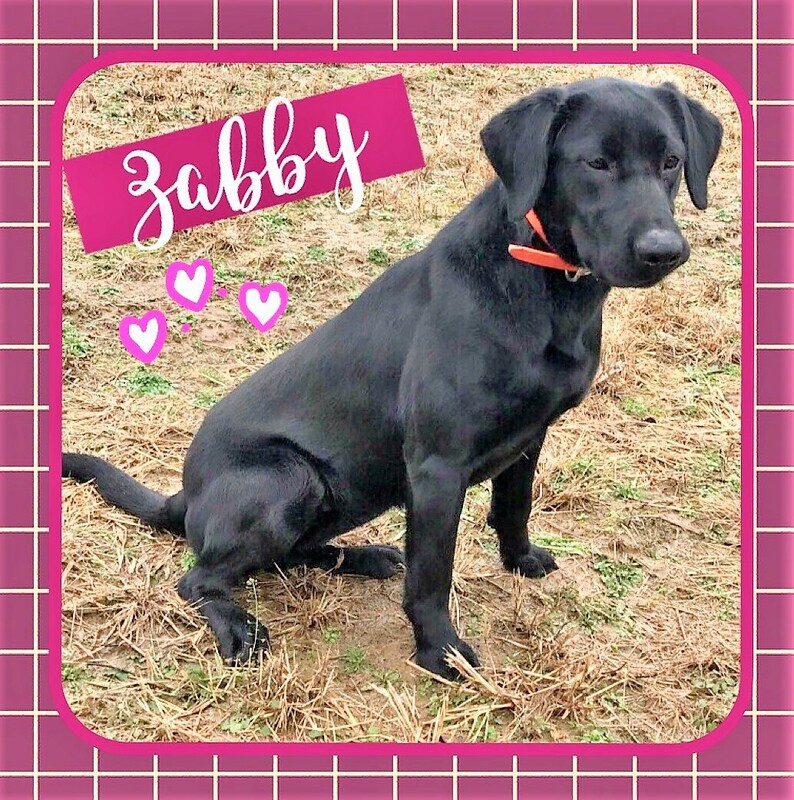 We were informed that Zabby is a purebred 15-month-old labby girl. She has a wonderful personality and super great with kids as her former family had 7 children. Their vet thought she may need ACL surgery, which we determined was indeed necessary, so the surgery has already been completed, and she is already on the road to recovery. Due to the expenses of a large family, they could not afford to invest in any procedures. We were told they were devastated to say goodbye but wanted to do whatever was needed to make sure she received proper care. There is no doubt she is a true beauty and will bring so much happiness to her new family.